The Double Dipped Life: Shop Contest!! Be my 900th sale (by item) and get your order DOUBLED!! You know you want Caramel Apples!! 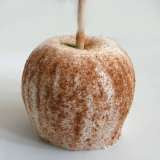 Visit my Shop for wonderful Caramel Apples and Dipped Pretzels! Wow those Carmel Apples look wonderful! OMG, those apples look delicious! I'm visiting from SITS and am heading off to explore your store. YUM!